The Digital Heritage Center does a lot of scanning on some really versatile machines. It’s one of the practical sides to our mission, and we take pride in being able to provide that service. What is perhaps less well known is that we also help cultural heritage institutions publish items they’ve scanned themselves. Many cultural heritage institutions have flatbed or book scanners as well as willing staff and volunteers, but lack the technical infrastructure to host those scans for the public. who offered their digital files to on-site users, but who were seeking a broader audience. Tell us about the original physical objects* – does your institution still have them? are there any rights or privacy concerns to sharing these online? what kind of subject matter is represented? Tell us about the digital files – who originally created them? how many are there? where do they live? what file types? how are they organized? is this an ongoing project? do you have any metadata already? If the files are a good fit for DigitalNC, they get transferred to hard drives, metadata is created or amended, and items appear on the site alongside the scans we create here at the Center. If you work at a cultural heritage institution eligible to work with the Center, have or are currently creating scans, and are interested in adding these to DigitalNC, contact us. We may be able to give them a home. * If there were any. We can help with born-digital items as well. DigitalNC has added more photographs to the M.S. 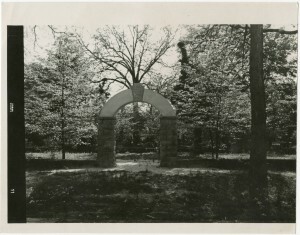 Brown Collection, provided by the Edgecombe County Memorial Library. 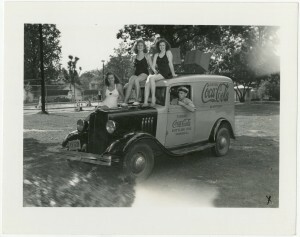 Milton Steele Brown, perhaps best known for opening a Coca-Cola bottling plant in Tarboro, was also an amateur photographer. 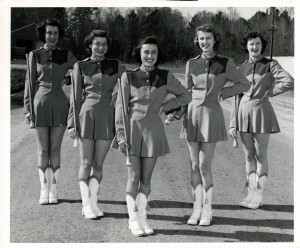 This latest batch of photographs is the last of the collection that is housed by the Edgecombe County Memorial Library. Mr. Brown photographed a large variety of events and subjects, providing a glimpse into the lives of Tarboro and Edgecombe County citizens. 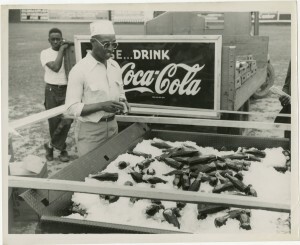 More photographs of some of Mr. Brown’s more common subjects are included in this batch, including the Tarboro High School Band and Majorettes, many events where Coca-Cola was served or promoted, homes and businesses around the county, and much more. For more information about what is included in the M.S. Brown Collection, visit the exhibit page or see these previous blog posts. 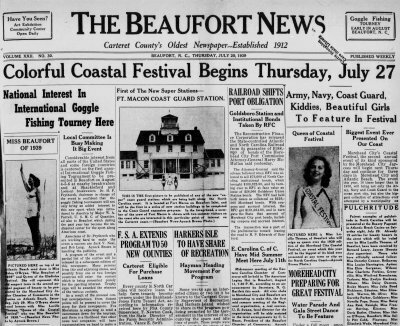 This front page of the July 20, 1939 issue of The Beaufort News announces the first annual Coastal Festival. These two titles feature news that’s particular to coastal communities. There is special emphasis on weather and its impact on travel, events, and maritime businesses. However you’ll also find news typical to community papers regardless of location: the impact of state government on local life, personal and business news, school events, and advertisements. Towns covered include not only Morehead City and Beaufort, but also much smaller communities like Newport, Wire Grass, Merrimon, Otway, Harlowe, Core Creek, North River, Davis, Harkers Island, Lenoxville, Lola, Russell’s Creek, Lenoxville, and more. We’ve especially enjoyed news items and advertisements related to Ocracoke Island, Hatteras, and other remote areas of the Outer Banks. These papers really increase the representation of eastern North Carolina on DigitalNC. To view more papers from points east (or elsewhere), head over to our Newspapers collection page. 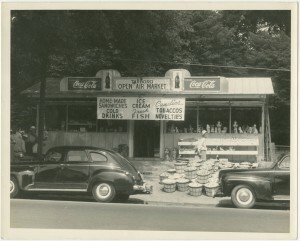 A number of new photographs from the Benson Museum of Local History have been uploaded to DigitalNC. These photos feature some of the prominent citizens of Benson, North Carolina, as well as everyday activities and life. 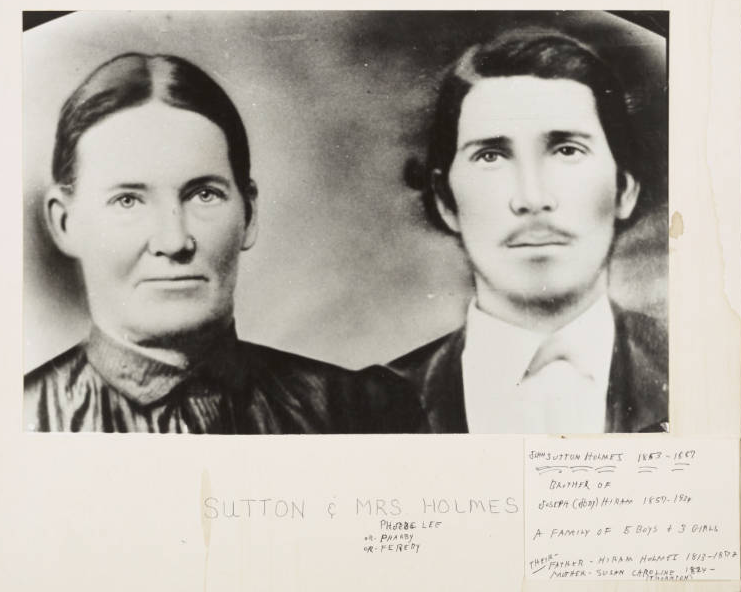 Viewers who have been keeping up with the photographs provided by the Benson Museum of Local History will find some familiar surnames, such as McLamb, Parrish, Woodall, and Whittington, as well as some new faces. This batch of photos also contains a few individuals who might be called local heroes. 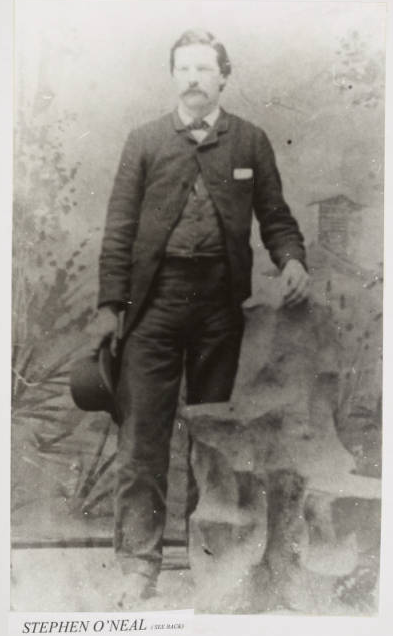 One man, Stephen O’Neal, was a wealthy businessman and donated land for Benson’s First Baptist Church. 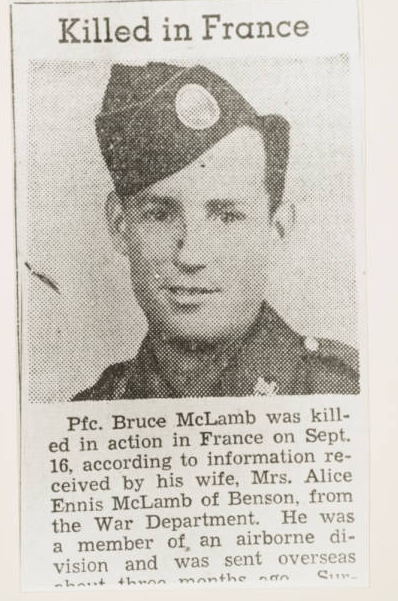 Another is an obituary for Bruce McLamb, who died in action in France during World War II. Also included in this batch is a number of drawings from a book published by the Eastern Carolina Chamber of Commerce. 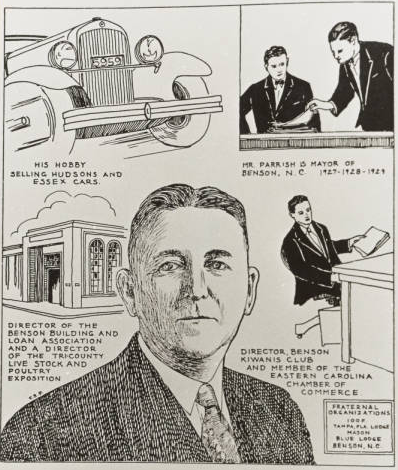 These drawings feature Benson men who were members of the Chamber and prominent in the financial and political life of town. 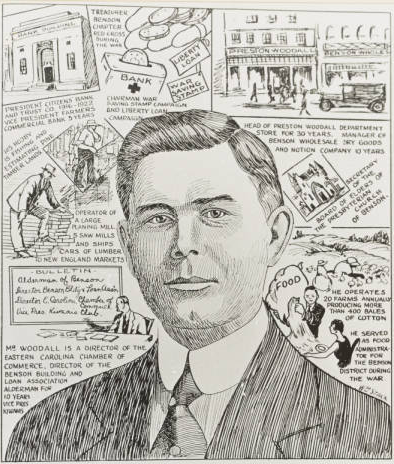 In addition to the drawings of the men themselves, there are cartoons depicting some of their activities and business ventures as well as a short biography. 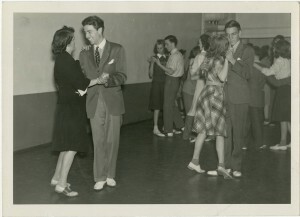 All photos provided by the Benson Museum of Local History can be viewed here. For more information about older batches, see our previous blog posts from June and September, and for more information about the museum itself and their collections, visit their contributor page or their website. 5 Scrapbooks, several fliers, a local mill’s employee newspaper, and an assortment of news clippings from the Rockingham County Public Library are the latest additions to the collaborative Rockingham County Legacy project. Bethel A.M.E. Church, Reidsville, N.C.
Birthdays were a pervasive theme among some of DigitalNC’s new additions from the Rockingham County Public Library. 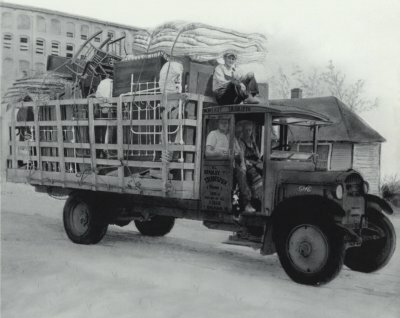 The Welcome to Madison Rockingham County – Wagon Train Scrapbook documents the festivities for the town’s 150th Birthday, including parades, dances, and competitions. 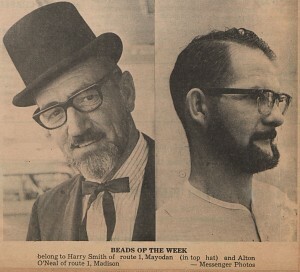 Perhaps one of the more interesting competitions was the “Beards of the Week,” featured in the back pages of the scrapbook. Sesquicentennial activities had Madison reliving earlier days, as the clippings demonstrate costumes from several different decades. The most popular period covered in the scrapbook appears to be the early 19th century, with men, women, and children all looking the part in articles from the Madison Messenger. The Madison Sesquicentennial Celebration  folder also features fliers, brochures, and order forms for the different events during the celebration. However, the town of Madison was not the only community celebrating. The congregation of Bethel A.M.E. Church, Reidsville, N.C. documented their Centennial Celebration with a booklet, as well. Speedwell Presbyterian Church and Some Rockingham County Churches are sets of newspaper clippings that document several other churches’ birthdays, anniversaries, and moments. 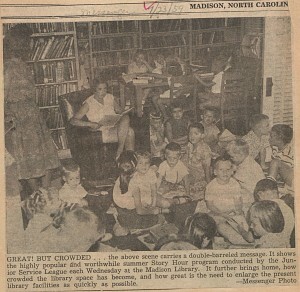 The Madison Public Library Scrapbook documents the successes and trials of several library branches in Rockingham County during the 1950’s. While Madison Public Library experienced growth, both in the collection and in numbers of users, it also faced budgetary and resources constraints. Rockingham County People Vol. I, Page 34. Rockingham County People, Volumes I-III, could serve as an interesting research tool to those seeking genealogical research about members of the Rockingham County community. The scrapbooks, sorted alphabetically, feature profiles of people who once resided in the county. Some profiles document the daily lives of everyone from church leaders to stay-at-home mothers, while others highlight the interesting and important accomplishments of people that represent the county. 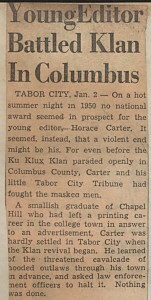 One such example is the story of newspaper editor, Horace Carter, who waged a print war against the Ku Klux Klan during the 1950’s. Carter attacked the Klan through his paper and aided the FBI and SBI in undercover work. He eventually won several awards including the Pulitzer Prize. To see any of the items featured here in full, along with the entire collection, visit the Rockingham County Legacy exhibit page. For more information about the Rockingham County Public Library and their materials, visit their contributor page on DigitalNC or their website.